As a heuristic and set of ideas for distinguishing between the “slowlane” traditional wealth method and the “fastlane” superior method, it’s fantastic. I read it after I’d already internalized most of the ideas, but if you think working for 40 years and retiring on your 401k is a good idea, this book will be a useful wakeup call. The first focus of the book is on distinguishing between the three different “roadmaps” to wealth. Wasting money, not saving, constantly in debt, living paycheck to paycheck, never going to become a millionaire. Sidewalkers look for “big hits” like the lottery instead of building wealth-generating processes. This is the path that most people are sold for becoming wealthy. Work hard for 40 years, put your money in index funds, retire when you’re 65. You have to deal with people you don’t like / office politics / etc. The danger of your health, what if you die young? The danger of your job, what if you get fired? The danger of your home, what if it devalues? The danger of the company, what if it goes under? The danger of your lifestyle, what if you don’t want to settle? The danger of the economy, what if there’s a recession? The danger of the sidewalk, what if you give up and start hoping for a big win? 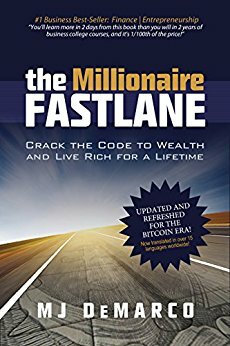 Slowlane millionaires make millions in 30 years or more. Fastlane millionaires make millions in 10 years or less. Slowlane millionaires need to live in middle-class homes. Fastlane millionaires can live in luxury estates. Slowlane millionaires have MBAs. Fastlane millionaires hire people with MBAs. Slowlane millionaires let their assets drift by market forces. Fastlane millionaires control their assets and possess the power to manipulate their value. Slowlane millionaires can’t afford exotic cars. Fastlane millionaires can afford to drive whatever they want. Slowlane millionaires work for their time. Fastlane millionaires have time working for them. Slowlane millionaires are employees. Fastlane millionaires hire employees. Slowlane millionaires have 401( k) s. Fastlane millionaires offer 401( k) s.
Slowlane millionaires use mutual funds and the stock market to get rich. Fastlane millionaires use them to stay rich. Slowlane millionaires let other people control their income streams. Fastlane millionaires control their income streams. Slowlane millionaires are cheap with money. Fastlane millionaires are cheap with time. Slowlane millionaires use their house for net worth. Fastlane millionaires use their house for residency. Slowlaners can’t control most of their variables (job, salary, ROI, etc.) so they focus on expenses, the one part they can control. Controllable Unlimited Leverage: instead of having no control and no leverage, you have maximum control and leverage. Business: Instead of being an employee, you run your own business, are a self-employed artisan, or some form of an entrepreneur. Lifestyle: The Fastlane is a lifestyle with blended beliefs, processes, and actions. Rapid Wealth Creation: Instead of building wealth over 40 years, you’re committed to building a large sum quickly. Compound interest from investments is way more useful when you already have a large sum of money. A 7% return on $10,000 is only $700, but that same rate on $5,000,000 is $350,000. Get the big sum of money, then use the slowlane investments. You have to create freedom and self-ownership, without those you can’t become rich quickly. Trying to hitchhike on someone else’s fastlane is dangerous, you have no control, and could get ruined.